Back in 2009 a group of South Sudanese community leaders recognised that the geographical spread of its community across Australia meant that there was a need for an event that focused on a chosen pastime was necessary to keep a link amongst the families and community. The South Sudanese Australian National Basketball Association was born and has expanded today to incorporate teams from across Australia coming together twice annually to compete for the National title from U16 – Open male and recently the inclusion of open female age groups. Fitzroy local Akeck “ Ketchy” Manyiel recognized the significance and need for a program on the Fitzroy “ Atherton Gardens’ Housing Estate and a partnership with the Fitzroy Police and Blue Light evolved with the assistance of Officer Chris McGeachan. 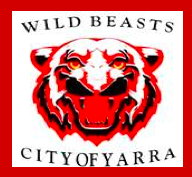 Both Vic Pol and ketchy saw the benefits of engaging local youth and the Yarra Wildbeast’s were born, 2010 seeing the first group of Beasts travel to Sydney to compete. Eighteen young boys taking to the floor in our first tournament which has evolved and extended to six male teams and one female team numbering some 70-75 youths in the program, plus our Mini beasts for kids under 12 aspiring to participate as the mature. Here is a video of the team playing in Sydney. 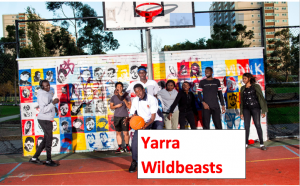 The SSANBA calls upon teams to have a mix of 60% African ethnicity with the remaining 40% of any cultural or ethnic background and we call upon the bulk of our participants to reside in the City of Yarra. We make exceptions for youth that have moved due to government placement of families and have several players that commute to training programs from the inner to outer western regions. Keeping youth involved in a program which they enjoy and place a high degree of significance in their life maintains engagement and disciplines that keeps them off the street and committed to retaining their position within the Beast nation. Many of our players participate in both domestic and representative competitions but often view the Beasts as their first love. Just last year we had to educate the younger kids that their responsibilities outside family, school and work were to represent their Representative team, their domestic team and then the Beasts. Some of our brigade had chosen to participate in a practice match fixture for the Beasts rather than a Grand Final for their domestic team. Whilst very satisfying how they rank our program we continue to educate and advise as required. The Dut family – with Deng the fourth of six kids – emigrated from war-torn South Sudan in 2005, when Deng was just four. They eventually settled in Collingwood, making a home in the housing commission flats that tower over Hoddle Street. Four years later Deng found basketball, scoring buckets during drink breaks of his older brother’s training sessions. 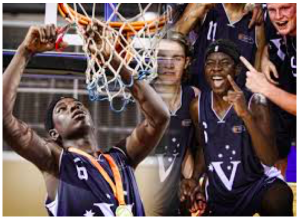 Since then he’s had stints with Coburg, Collingwood and Waverley but is now back with the All-Stars, competing in the Melbourne United Victorian Junior Basketball League’s (MUVJBL) U18 Victorian Championships and in the Big V.
Vic Metro head coach Darren Perry recognised the potential. “Sometimes it’s difficult for the guys from the smaller clubs at those trials,” Perry said. “The amount of structure can sometimes trip them up in the early going. “You wonder whether some of those guys with talent are able to play in the kind of structure that’s required to compete at the National Championships. And yet, it wasn’t until the final countdown that Dut solidified his spot. “We brought him up to the East Coast Challenge and, to be honest, we probably thought that was as far as he was going to go,” assistant coach Chris Anstey explained. “But the better the kid you put against him, the better he played. In many ways, the journey of this year’s U18 Vic Metro Men’s team is embodied by Dut’s progress within it. Perry’s squad was considered a long shot to take out the tournament but the boys kept working, improving every step of the way. 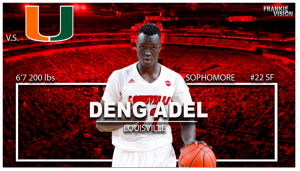 Another notable alumni is Deng Adel who has competed with the Louisville Cardinals this past three years whilst studying at the University of Louisville an NCAA Division 1 college. Deng was one of the boys on our fist trip in 2010 and drops into trainings when home from the USA. Deng’s ability has seen him nominate for the NBA National Draft in 2018 and we wish him the best of luck in securing a spot on an NBA roster. Such is the significance of this program in conjunction with the associated and more recognized domestic and representative associations that has enabled Deng the opportunity of an overseas scholarship and chance to play in the biggest league. We receive support from a range of statutory authorities including Victoria Police, Yarra Blue Light, the City of Yarra, plus individuals or community groups Rotary Club of Fitzroy, Harrington Earl Estate Agents, Richmond Budget Truck and Bus Rental but like many not for profit associations our costs are higher than the contributions received each year. We scrounge, run fund raising events and look to whatever means possible to ensure the continuation and viability of this program so we seek your help. Whilst as little as $2 is deductible we would be pleased if you could find a little more. Sponsorship with logo recognition is available with some exciting developments of new livery, the release of a short film, new web and social media platforms. Include your postal address and we shall return a tax deductible receipt.